Below are commonly used terms related to patent oppositions and patents. The decision by a patent applicant to no longer pursue a patent application. An application is considered abandoned when an applicant fails to respond to a pending issue of the Patent Office. Generally, an applicant is free to abandon his or her patent application at any time. The chemical substance responsible for a product’s effect. Also called ‘substance’. Literally, friend of the court. Someone who offers information to educate the court on points of law, but who has not been solicited by either side of the case. Claims are the part of the patent application where the inventor defines the legal scope of a patent and what will be protected by patent law. The combining of different drugs in the same medicine. Combinations are one of the factors of a drug which may be patented. A claim which opposes a claim made by the other party in a court case. A legal provision that prevents data collected for the purpose of obtaining marketing approval (e.g. the results of clinical trials) from being used by regulatory authorities to grant approval to a generic equivalent for a specified period. An obligation imposed on third parties to protect test data (e.g. the results of clinical trials) – usually collected to comply with government regulations on the safety, efficacy and quality of a broad range of products (e.g. drugs, pesticides, medical devices). The TRIPS Agreement provides for the protection of such data against unfair commercial use. Drugs derived from a chemical compound of similar structure, e.g. by replacing one component. Derivatives may be used as a claim of invention in a patent application. The first public disclosure of details of an invention. This may be what is described in a patent application - or deliberately revealed outside the patent system, to make the invention unpatentable. In return for a patent, the applicant must make a full disclosure of the invention for which patent protection is sought. A type of patent application which contains matter from a previously filed application. The dosage of a medicine may be how much is taken at a time, how frequently, or by what method. A new type of dosage for an existing medicine may be used as a claim of invention in a patent application. The European Patent Office is a regional patents office created by the European Patent Convention to grant European patents, based on a centralised examination procedure. A term popularly used to describe patenting strategies that are intended to extend the patent term on the same compound. The examination of the patent application, undertaken by a patent examiner, to determine whether the application complies with all the legal requirements for patentability set out in the legislation. 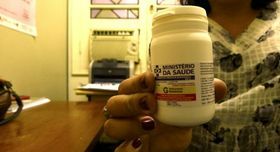 A drug used as part of the first treatment used for a disease. The form a medicine takes, e.g. a pill, liquid or powder. A new formulation may be used as a claim of invention in a patent application. According to WHO, a pharmaceutical product usually intended to be interchangeable with the originator product. A patentability requirement; the invention should be capable of being made or used in an industry. A system used to facilitate the identification of pharmaceutical substances or active pharmaceutical ingredients. Each INN is a unique name that is globally recognised and is public property. The WHO is in charge of assigning INNs. A preliminary, non-binding opinion, established by the International Preliminary Examining Authority on the request of the applicant, on the questions whether the claimed invention appears to be novel, to involve an inventive step (to be non-obvious), and to be industrially applicable. Report established by the International Searching Authority containing citations of documents considered to be relevant for the claimed invention (relevant prior art), the classification of the subject matter of the invention and an indication of the fields searched as well as indications of any electronic data base searched. Furthermore, it may contain remarks concerning unity of invention. An invention is considered to include an inventive step if it is not obvious to a skilled person in the light of the state of the art. At the European Patent Office *(EPO), the inventive step is one of the most important criteria (along with *novelty and industrial application) that need to be fulfilled in order to obtain a patent. The US Patent and Trade Office employs the concept of non-obviousness, which is equivalent to the inventive step criterion of the EPO in a legal context. The legal right to initiate a lawsuit; the ability of a party to bring a lawsuit in court based upon their stake in the outcome. A patent may be granted on the grounds of new use, if a pharmaceutical corporation wishes to market an existing compound to treat a completely different condition than what it was previously used for. If an application for a patent is to be successful, the invention must be novel (new). The invention must never have been made public in any way, anywhere, before the date on which the application for a patent is filed (or before the priority date). In some countries, when talking about pre- or post-grant patent oppositions, the word ‘observation’ is used instead of ‘opposition’. Generally, the is the product that was first authorised worldwide for marketing, normally as a patented product, on the basis of the documentation of its efficacy, safety and quality. Used in contrast to ‘generic’ product. An exclusive right awarded to an inventor to prevent others from making, selling, distributing, importing or using the invention, without licence or authorisation, for a fixed period of time. In return, the patentee discloses the invention to the public. There are usually three requirements for patentability: novelty (new characteristics which are not prior art);** inventive step** or non-obviousness *(knowledge not obvious to one skilled in the field); and *industrial applicability or utility. An international treaty, which was signed in 1970 and went into force in 1978. The PCT provides the opportunity to seek patent rights in a large number of countries by filing a single international application (PCT application) with a single patent office (receiving office). The PCT procedure consists of two main phases: (a) an "international phase"; and (b) a PCT “national/regional phase”. PCT applications are administered by the World Intellectual Property Organisation (WIPO). The patent situation for a specific technology in a given country, region or on the global level. The relevant legal conditions that an invention must meet to be granted a patent. Awaiting assessment or a court decision. A patent opposition that is filed after a medicine has been granted its patent. A patent opposition that is filed while a medicine is still going through the patent assessment process. Publications or other public disclosures made before the filing (or priority date) of a patent application against which the novelty and inventiveness of the invention in the patent application is judged. The date that the first patent application for a specific invention was filed. In patents, the means by which a medicine is manufactured. A new process may be used as a claim of invention in a patent application. The frequency or duration for which patients are instructed to take a medicine. A new regimen may be used as a claim of invention in a patent application. In some countries, when talking about pre- or post-grant patent oppositions, the word ‘representation’ is used instead of ‘opposition’. Termination of the protection given to a patent on one or more grounds, such as a lack of novelty. The means by which a medicine is taken, e.g. orally or by injection. A new route may be used as a claim of invention in a patent application. Used when a first-line drug or drugs are no longer effective. Trade-related Aspects of Intellectual Property Rights. The TRIPS Agreement signed in 1994 is an international agreement administered by the World Trade Organization (WTO) that sets down minimum standards for many forms of intellectual property rights. United States Food and Drug Administration. The FDA is responsible for protecting and promoting public health through the regulation and supervision of pharmaceutical products. United States Patent and Trademark Office. The USPTO administers the examination and granting of patent rights in the United States. The requirement that a patent can only refer to a single invention, or a group of inventions which are closely linked to form a single inventive concept. An application for a patent may be withdrawn at any time before it is granted. An agency of the United Nations, formed to promote the protection of intellectual property throughout the world.